Often families feel like their lower-level is personal space, where a lot of everyday living goes on. That’s were lower-level finishing comes in. The den. The man cave. The game room. There are so many better names for the basement, especially after it’s been finished, remodeled and transformed into the room of your dreams. Need a new space to entertain guests, watch the game or work on your home business? Lower level finishing for your St Paul home may just be the solution for you. If your basement is being used only as a storage area, why not turn that place into “the place” to hang out? From a beautiful home theater, to office space, to an extra bedroom or playroom, there are many ways the lower level of your home can be transformed from wasted to wonderful – and often, in a short amount of time. Titus Contracting specializes in lower level finishing, and we would love to help transform your space. Everyone knows a finished basement is a major plus when searching for a new home. Lower level finishing can add major appeal to your home when it’s time to sell. And, since the basement is already a part of your home, there are no costs associated like with building an addition. The foundation, load-bearing walls, floors, and ceiling are all already in place, so that eliminates the need and costs associated with building a new part of your home. You get additional space for you and your family to use at a fraction of the cost. Another budget-friendly reason to finish your basement is to make it more energy efficient and help save on utility bills. We can fix any air leaks or insulation problems as well as put in new, more energy-efficient windows. Lower level finishing is the opposite of one-size-fits-all. You could have the entire space made into a home bar with a mini eat-in kitchen area, an entertainment room; or, section off a home office, create a bedroom for the in-laws or incorporate a playroom for the kids. Really, whatever you can imagine we can design! You can even get that pool table and kegerator you’ve always wanted. You might use your basement for storage right now, and chances are, larger appliances like your furnace are down in your basement too. But think of all of that wasted space you and your family could be using! There are so many different and new purposes for your basement when you tackle a lower level finishing project. And with good reason! Lower level remodeling is one of the best home renovation projects for homeowners looking to get the most bang for their bucks. Here are a few of our favorite reasons for lower level remodeling. Your basement is already a part of your home, so there are no costs associated with building an addition to your home. The foundation, load-bearing walls, floors, and ceiling are all already in place, so that eliminates the need and costs associated with building a new part of your home. You get additional space for you and your family to use at a fraction of the cost. Your lower level remodeling project is not just limited to one use. You could have the entire space made into a home bar and entertainment area for friends and family, but you could also section it out so one part is a home office, another part is a playroom for the kids and another part is a home theater. Really, your imagination is the limit here! So you can finally get that wine cooler you’ve always wanted. You might use your basement for storage right now, and chances are, larger appliances like your furnace are down in your basement too. But think of all of that wasted space you and your family could be using! There are so many different and new purposes for your basement when you tackle a lower level remodeling project. A finished basement is comfortable all year round. It is cool in the summer and warm in the winter. This means you get year-round enjoyment of the space, so there will never be a season where your basement is unusable. A company like Titus Contracting will ensure your basement is properly insulated so you and your family will be cozy in the winter and cool in the summer. Your lower-level is perfect to take on as a winter remodeling project. When you hire us for your lower level remodeling project, finishing your basement means it will be more energy efficient. We can fix any air leaks and insulation problems, and we can even put in newer and more energy-efficient windows. That way, your heating and cooling bills could decrease too. These are just a few reasons to choose lower level finishing for your St Paul home! 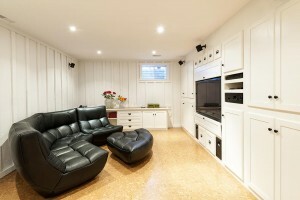 We’ll help you cover everything that you need to consider for a basement renovation in advance.